This is a very simple yet elegant pasta dish — perfect for entertaining a few friends or as an intimate dinner for two. The recipe combines recipe preparations from a couple other posts of mine and then makes it magical with Alton Brown’s Beurre Blanc recipe. It’s a wonderful dish for the weekend! Combine the shallots, white wine, and lemon juice in a saucepan over high heat and reduce to 2 tablespoons. Add the cream to the reduction. Once the liquid bubbles, reduce the heat to low. Add the butter, one cube at a time, whisking first on the heat and then off the heat. Continue whisking butter into the reduction until the mixture is fully emulsified and has reached a rich sauce consistency. Season with salt and pepper. In a large serving bowl, add prepared shrimp and brussels sprouts. Pour sauce over them and toss to coat. Love everything about this dish! Ok Kenley, you’re killin’ me here, did you mean not to share the recipe for this mouth watering dish? omg! this looks so appetizing! Definitely a keeper recipe…thank you! Oh my Kenley, this looks so good. I can’t wait to have our new home started and making this in the new kitchen will be great!! For my sups earlier I went with Tilapia fish in a buttery sauce (not even a proper reduction like yours! ), spaghetti and hazelnuts. Even though I can’t deal with much butter it was delish. Can only imagine just how amazing this was! Loving the idea of the Brussels sprouts in there as well. 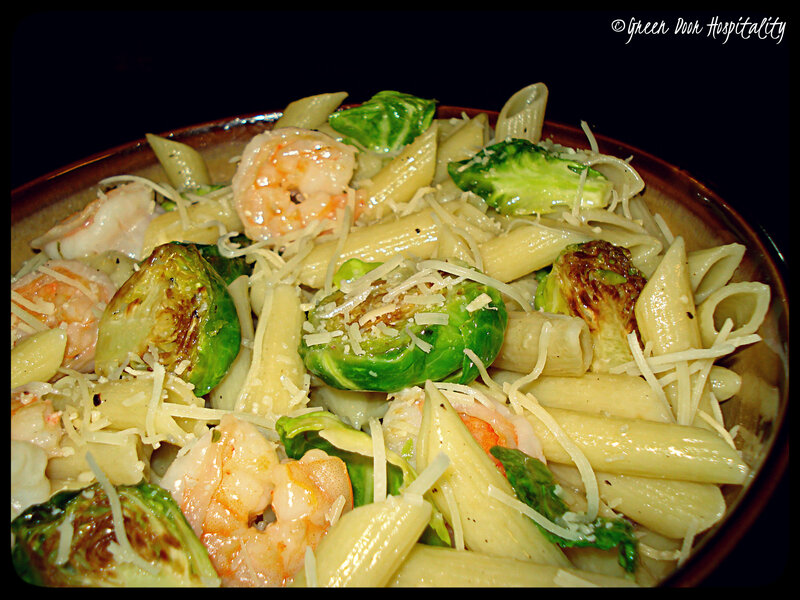 I love pasta, I love Brussels sprouts… with beautiful shrimps and lovely sauce… YUM! We’re huge fans of pasta and shrimp, so this sounds delicious! Can’t wait to try the Beurre Blanc! This entry was posted on September 6, 2013 by Jessica Romigh in Elegant and Affordable and tagged Alton Brown, beurre blanc sauce, brussels sprouts, butter, gluten-free, heavy cream, lemon garlic shrimp, lemon juice, penne pasta, roasted brussels sprouts, shallots, shrimp, white wine.